Design for emotion, not just efficiency. Jim Lefever of DXC has thousands of employees, most of whom he’s never met. Still, he wants people to feel welcomed into the company from day one. Design thinking is the perfect tool to help him and his team do that. Its core principle is empathy, so Jim and his team relabeled each phase of the new-hire journey with an employee-centric name. “Recruiting” became “Hire me,” for example. DXC used journey mapping to find pain points during onboarding, like paper contracts in a company whose business is digital transformation. And they kept the big picture in view at all times with a single question: “What do we want employees to say to their loved ones at the end of their first day?” The talk must be good. Jim said turnover fell by 8 percent in the program’s first year. Show employees how their feedback makes a difference. Kaiser Permanente (KP) has a strong member experience. Angela Howard, director of talent management & culture, told attendees: “we think the same standards that drive how we treat members should drive how we treat each other.” There are nine such standards, one of which is asking what matters to people and actually listening to what they say. Employee listening showed KPers take pride in their work and want to give members a great experience. They just felt thwarted by roadblocks like understaffing and lack of empowerment. The EX team mapped how things would look if those roadblocks were gone and is systematically working to turn that ideal into reality. Some changes were easy, like making sure employees know everything they can do. They’re actually more empowered than most realized. Bigger programs include a prototype clinic designed with an eye toward experience. Employees get updates on this work regularly, so they know the company is paying attention. The EX team’s motto is “don’t be an askhole” – someone who asks for advice then ignores it or does the opposite. Seems to be little risk of that here. Make it safe for employees to own up to mistakes. It’s scary to admit you messed up at work, but great leaders do it anyway. Why? To foster a culture of psychological safety. According to Google, that’s the #1 thing that separates good teams from great ones. David Horsager explained why. Humans work harder for leaders they trust, he told attendees. And according to his research, we’re more trusting of people who are open about their mistakes than those who try to look perfect. One executive helped attendees confront the role they might be playing in dysfunctional relationships by admitting she was once the horrible boss people changed jobs to get away from. Kat Cole shared that in her early years as president of Cinnabon she was so worried about being liked she failed to ask tough but important questions, and got into hot water with franchisees as a result. The experience was painful, but ultimately helped her grow into the powerful leader she is today. Help individuals live company and personal values every day. 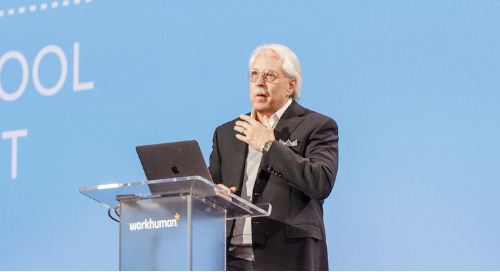 As I look back on these and other stories from Workhuman Live, one thing is clear – we have enormous power to change employee experience just by being a part of it. Those three days left me with new ideas for how I can make work better for the people in my ecosystem, and left me feeling inspired and optimistic about the future of corporate workplaces.